In “Danger Came Smiling,” art historian and published author, Maria Elena Buszek, brings together work by contemporary artists who use popular music as a medium, subject, and reference point for feminist messages. The show takes the title of an album by the unabashedly feminist punk band Ludus, led by artist Linder Sterling, whose career—emerging in the first wave of punk in the 1970s—is a pioneering example of the approaches at play in this exhibition. The show will be on view July 23, 2016 – Jan 1, 2017. Free public reception, July 23 from 6:00 – 8:00 pm with a VIP member preview from 5:00 – 6:00pm. 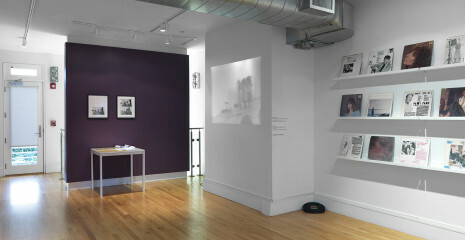 “By the late 1970s, visual artists like Robert Longo, Barbara Kruger, and Jean-Michel Basquiat joined bands, and musicians like DEVO, Talking Heads, and Ann Magnuson treated their music as performance art, blurring the lines between popular music and visual art in ways that have profoundly affected contemporary art ever since,” explains Buszek. Music and feminist activism are often associated with art student Kathleen Hanna’s work in starting the “Riot Grrrl” movement by way of her punk band Bikini Kill in the 1990s. This rich intersection of art, music, and activism will be explored more broadly in “Danger Came Smiling” through the work of artists who use punk, hip-hop, electronica, and jazz as part of their studio practice, and a reflection of their politics. The Franklin Street Works café will include an audio portion comprised of a “mixtape” relating to the items on display and eras under consideration in the exhibition. Maria Elena Buszek, Ph.D., is a scholar, critic, curator, and Associate Professor of Art History at the University of Colorado Denver, where she teaches courses on modern and contemporary art. Her recent publications include the books Pin-Up Grrrls: Feminism, Sexuality, Popular Culture (Duke University Press Books, 2006) and Extra/Ordinary: Craft and Contemporary Art (Duke, 2011). She has also contributed writing to the numerous, international exhibition catalogues and scholarly journals: most recently, essays in Dorothy Iannone: Censorship and the Irrepressible Drive Toward Divinity, Mark Mothersbaugh: Myopia, and In Wonderland: The Surrealist Adventures of Women Artists in Mexico and the United States. Buszek has also been a regular contributor to the popular feminist magazine BUST since 1999. Her current book project, Art of Noise, explores the ties between contemporary activist art and popular music.